You don't need a swap partition unless you plan to use hibernation. The installer will create a small swapfile. Most modern computers have more than enough memory, so swap space doesn't get used much. The installer gives you a choice of ext2/3/4. If you want something else, format the partition before running the installer, and select "Do not format" in the installer options. I recommend that you use ext4. Edit: To make live snapshots, you should have free space equal to twice the space used by the installation. Okay, I was able to install LFA using refractainstaller. And I was also able to create a new live disk using refractasnapshot. So that seems to be working. Thanks! 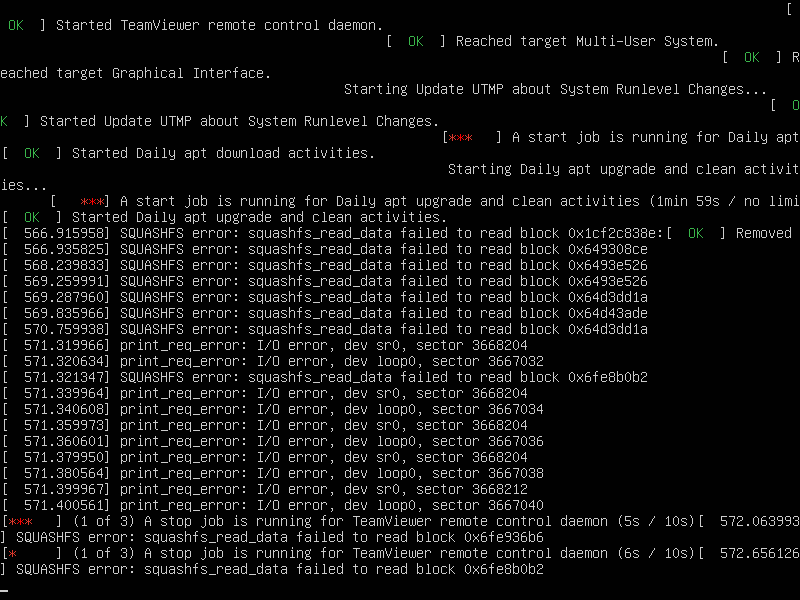 However, I see a lot of "failed" things when shutting down the machine. Not sure if it is an issue related to refracta or not. Here is a screenshot. This actually locks up the VM. I am unable to shut down the guest completely, and end up having to terminate VMware using Task Manager in Windows. That looks like shutdown messages from the live iso, with mention of squashfs and loop0. I'm not familar with current vmware, but in virtualbox, I don't bother to shut down a live iso - I just turn off the VM. Since there are no mounted filesystems at the time, and it's a read-only system, it can't hurt anything. If that's the shutdown message from the installed system, then I don't know what's going on. It was from the live disk, so I guess we can ignore it. Thanks.